Stephen Strasburg might not start the year in the Washington Nationals pitching rotation, but when he is brought up to the majors, watch out for this kid. The Nationals number 1 pick out of San Diego State, pitched 109 innings last year in college with a 1.32 ERA. He recorded 195 strikeouts, while allowing only 19 walks. Sick! 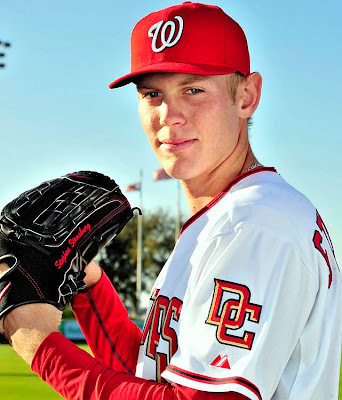 Strasburg has a four year deal that will pay him $15.5 million with a $7.5 million signing bonus. He is 6'4" and 220 pounds with an upper 90s fastball and a power curve. He will need to develop his change-up since he didn't need to throw it in college that much. The Nats hope his work in the minors will be quick and productive. For one, they aren't paying those big bucks for him to perform in the farm system, and secondly, they hope he can lure a fan base out of hiding in the nations capitol. Washington was third worst in major league attendance last year, drawing just over 23,000 per home contest. At least the kid won't have to stay in Washington but four years. When, and if, he does depart, there are a lot of politicians I hope he takes out of town with him!